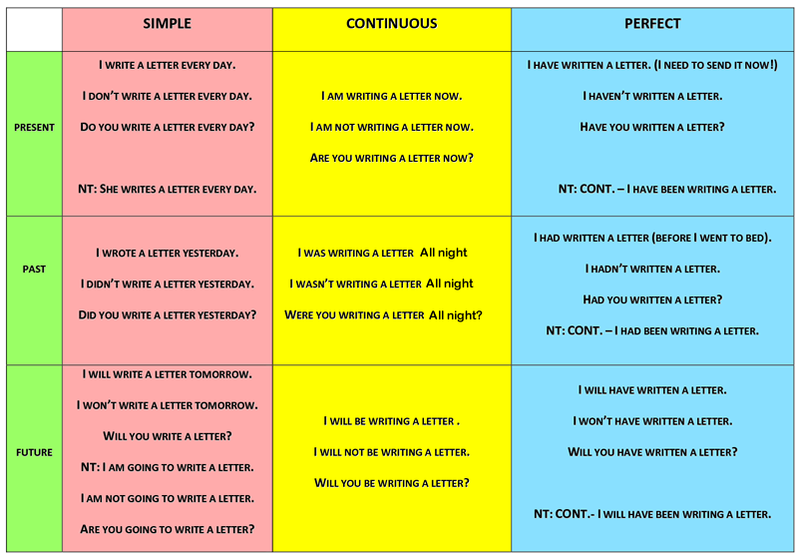 First up is the most famous and, I would argue, the easiest way to make your writing better: varying your sentences. To see what I mean, look at this very famous example from the late, great Gary Provost. This is the single best example of I've seen of the immense power of sentences. Without changing your story, or even what you were going to say, you can vastly, vastly improve your writing simply by saying it in a different way. This works is because readers are no different than any other audience. Humans universally appreciate variations in patterns. Just as we don't like to hear the same three chords in music or the same three colors used in every painting, we don't like to hear the same pattern in our language. As novel authors, we're primarily invested in meaning--characters, plot, world, story, and so forth. 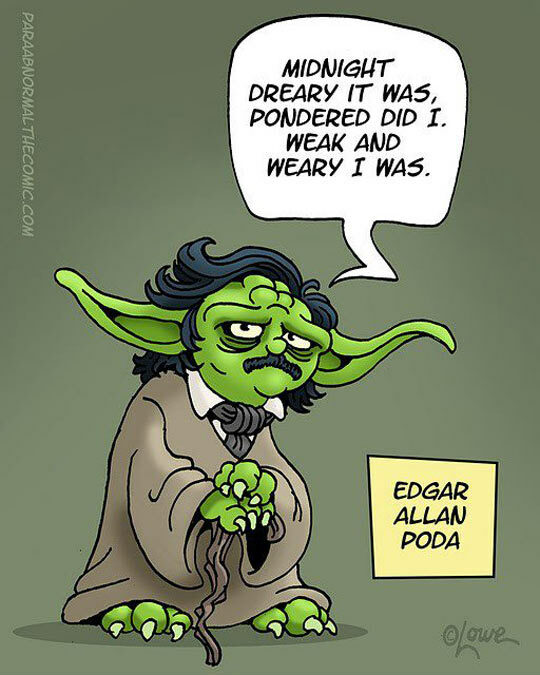 Because of this, we too often let our prose grow lazy. It's easy to slack off and stop thinking about paragraph level writing when you're on paragraph #2039586803. But laziness in all its forms is the enemy of good writing. Everything we value in fiction--genre or otherwise--is only possible through words. Prose is the window to our worlds, the notes to our music, and it's our job as authors to be thoughtful at all levels of construction. When a reader opens your books, words are the first thing they see. Not story, not characters, not hooks. The very first impression they get of us as authors comes in a word followed by another word followed by another. All of these words pile up into the thing we call story, but if we don't think about how that pile is formed, we will never be more than half the writer we could have been. So if you take nothing else from this list, I hope you'll take a moment to think about varying your sentences. You don't have to be poetic about it, but just taking a second to make sure every sentence in the paragraph doesn't start with the same "She saw, she walked, she thought" construction can do absolute wonders for your writing. Trust me, your readers will thank you. Way back in the day, when I was but a wee little writer with dreams of publication dancing in my head, I wrote a book that was rejected by everyone in New York. "Paragraphs should be no more than four lines. Yours are way too long. My eyes glaze over and I just stop reading." This sounds harsh in retrospect, but it hit me like a lightning bolt to the brain. In high school English, I'd always been taught that paragraphs had to be at least three sentences, but I'd never heard of an upper limit. This is because, technically, there isn't one. So long as you stay on the same idea, your paragraph can go on forever. But while you absolutely can do this, and many authors have, it's not always a good idea. 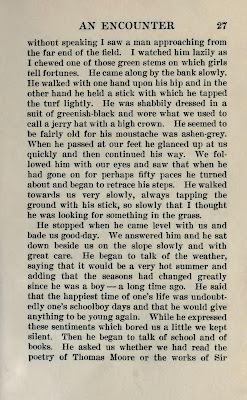 To see what I mean, let's take a look at a random page from James Joyce's Dubliners. This is what we in the modern parlance would call a "Wall o'Text." Granted, it's also a vital piece of the literary cannon and an important work, but just look at that page. That is intimidating, which is actually exactly what Joyce wanted. He made his books purposefully hard to read because he wanted his reader to have to work for the story in the belief that we'd get more out of it that way. But while I suppose there's a grain of truth to that, and Joyce certainly has his fans, his books are also famous for being books people start, but don't finish. They're simply too hard, too intimidating for most readers, and that's not what I want. I'm an unapologetic genre writer. I write fun, fast paced stories designed to grab the reader and whisk them away. This isn't to say my books are brainless escapist reading. I most definitely have something to say in every volume, but that doesn't mean I have to be obtuse about it. When I write fiction, my goal is to be as interesting and readable as possible. I aim to entertain always, because that's why my readers are here: to be entertained and delighted. 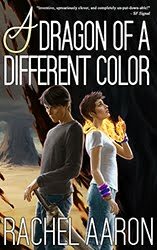 That is the magic of genre fiction, and part of that magic is writing in an approachable, interesting, fun-to-read style. To this end, short paragraphs are preferable to long paragraphs because, quite frankly, they're easier to read. Now, again, this is a personal stylistic choice, but it's one that's served me very, very well. I've always found that when I'm struggling with a complicated idea or a long description, breaking the text up into bite-sized chunks not only make the text read faster, but readers are more likely to actually read all of it. There's a reason TLDR is a thing. It's a fact of life that eyes glaze over when we see giant walls o'text, and if there's one thing we never, ever, ever want as authors, it's readers who don't read. This isn't to say you can never have a long paragraph. It's your book, you can do anything you like! But if your manuscript looks like the image above, it would be worth your time to see if you can break some of those monsters up. Many times, you won't even have to change the text. Whether you're writing fiction, essays, or even blogging, just adding that extra visual break can make a huge difference in reader engagement. It's a very simple fix that's easy to undo if you change your mind, so if you're having an issue with dragging text, I heartily encourage you to give it a try! Click for a readable version! This is another of those high school English things that I wish I'd paid more attention to at the time. Any writing you do inevitably involves choosing a tense. 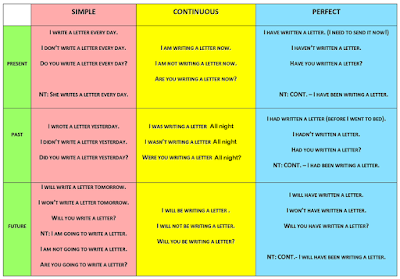 Past tense is the most common and, in my humble opinion, the easiest to work with because it has the widest range. You can write scenes from multiple parts of your timeline without ever having to worry about your verbs, you can speed up or slow down the action at will with nothing but sentence structure, you can even jump narrators with little more than a line break without derailing the reader's perception of where we are and what's going on. All of these reasons make past tense the most popular tense for fiction and the closest thing we have to a default. It really is the most verstile tense! But just because it's common doesn't mean it's the best. 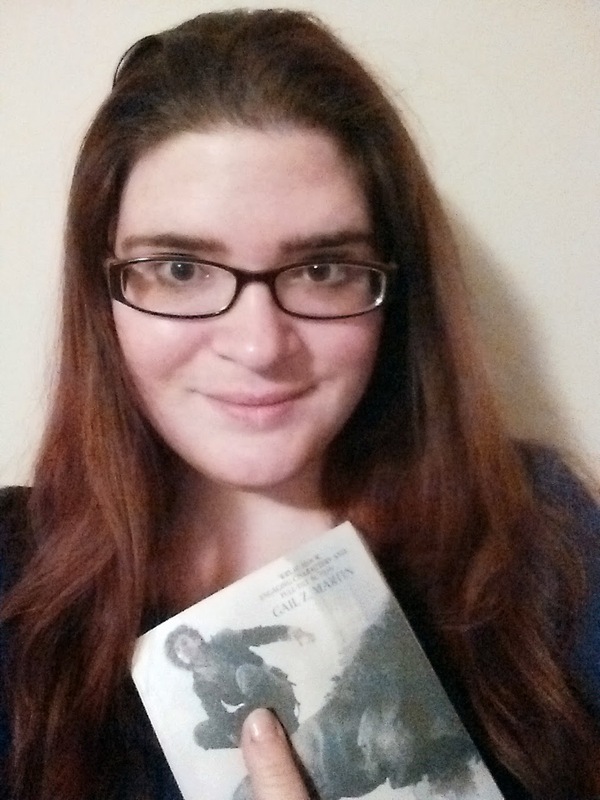 If you've read any YA in the past decade, you've almost certainly read stories written in present tense, probably first person present tense. This is because present tense, unlike past tense, comes with the added bonus of immediacy. To see what I mean, look at these two paragraphs. "The shots whizzed over my head, missing my hair by inches." "The shots whiz over my head, missing my hair by inches." As you can see, both of these sentences are in first person, which gives us a feeling of "being there" already, but the second sentence is even more intense because of the tense. Those bullets didn't whiz by at some unspecified time in the past, they're whizzing by right now. Right this very moment! This is the power of present tense. By setting our action in the now, not only do we amp the tension, we also remove the implication inherent to past tense that the characters live to tell us what happened. Present tense is the verb equivalent of the embedded war zone reporter with all the danger and suspense that implies. But while that is super thrilling by default (hence why present tense is so popular in teenage fiction, which thrives on danger and drama), all that constant tension can also be exhausting. There's no easy breaks in present tense. It's always happening right now, which means unless you want to write a purposefully low energy scene and run the risk of being boring, you have to keep running all the time. When done well, present tense can be thrilling and edge-of-your-seat tense, as we saw in The Hunger Games. When done poorly, however, present tense novels can be exhausting and samey, like listening to repetitive music at way too high a volume. The challenge is all in the execution, and if you're not 100% sure you know what you're doing, choosing the wrong tense is picking up enough rope to hang yourself. Now, obviously, it is entirely possible to write amazing novels in any tense. Writers do it all the time, and I'm not here to say they're wrong. Just because I prefer the ease and versatility of past tense doesn't mean I'm right, it just means I know what I like. That's important, because you should know what you like and why. You should feel comfortable with your own writing, because if you're not, no amount of effort on your part or anyone else's will ever make that text feel anything but strained and uncomfortable, because that's how you were when you wrote it. Voice as an author isn't just about what you say. How you say it is equally as important, as is how you feel while writing. If you're struggling with your verbs and tension, that dischord is going to show up in your books, because we are our writing. This is why it is so, so important to put as much thought and consideration into these prose level choices as we do into our characters, world, and story. This stuff matters. Choices like these color every word we write, so while I won't tell you what tense to write it, I will ask that you think about your choice. Don't just write something because you think you have to. Know what grammar you're choosing, and then chose your style deliberately and confidently. If you find out later you were wrong, change it. Rewrite the whole book if you have to, just make sure you're happy with the words you're putting down, because if you're not, no one will be. I hesitated to put this in because it's so ubiquitous. Hating on passive voice is pretty much the national author and editor passtime, and yet it is so misunderstood. I've met writers with dozens of books under their belts who can't explain passive voice to me. Clearly, this is a hazy area. So, to clear things up a bit, here's what passive voice is not. 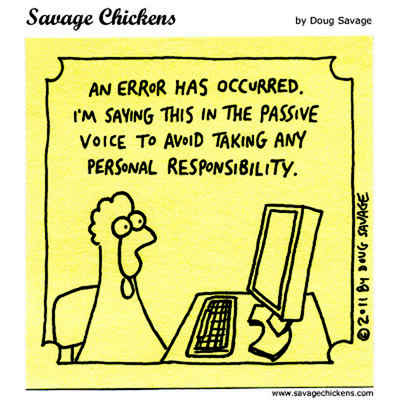 Passive voice is not a grammatical error. It is absolutely grammatically acceptable to be passive in writing. Passive voice is not inherently evil. It is a stylist choice, and like all choices, it can be used badly or to great effect depending on the author. The passive voice is simply a sentence construction where the subject of the sentence is also the object of the verb. "Devi shot the alien." is active voice. The subject (Devi) of the verb (shot) is actively acting on the object (the alien). "The alien was shot by Devi." is passive voice. In this case, the subject and the object of the verb are the same: the alien. He/she/it is what we're talking about and the one who was verbed. Meanwhile, Devi, the main character who should be the star, is grammatically forced to become a passenger in her own sentence (and she's pissed about it!). The meaning of both sentences is still the same--a gun was fired, an alien got hurt--but the emphasis is very different. In the active voice, Devi is the master of her sentence. In the passive voice, the focus is on the alien. That said, both sentences are correct, which means the one you choose is a just that: a stylistic choice. Making choices is what authorship is all about, but while both choices are technically correct, I'm going to bet the vast majority of you prefer the active sentence over the passive one simply because it's a) clearer, and b) more exciting. Devi is shooting an alien! That's awesome! The passive sentence is more contemplative, more detached. That's not so great for alien shooting, but what about this? That's right. Mark Twain, who knew a thing or two about sentence construction, used the passive voice frequently! This is because passive voice is a great stylistic choice when you're trying to emphasize the object for dramatic effect. In this example, the thing that makes this joke funny "the reports of my death" is the object of the verb "exaggerated." The implied subject, in this case the reporter who has erroneously proclaimed Mr. Twain dead, is merely an afterthought. He's not part of the joke, and therefore not important to the sentence. In this case, an active version of the sentence, such as "The reporter has greatly exaggerated the reports of my death" isn't nearly as memorable or strong. This is a perfect example of how the passive voice gets a bad rap. Yes, it's bad most of the time, and almost always when used by accident. But in the hands of a master, it can also be used to great effect. The trick, though, is that you have to know what you're doing. So if you're serious about improving your prose, I would strongly suggest you spend some time getting to know the passive voice in all its myriad forms. There are a million places to learn about this online, but a quick and dirty way is to ask, "What is important in this sentence?" In this example, the passivity itself is part of the story. No woman in the world looked hard for a unicorn than Molly did when she was young. Now, unexpectedly, in the inglorious middle of her life, long after she'd given up on dreams, the last unicorn comes to her by chance. 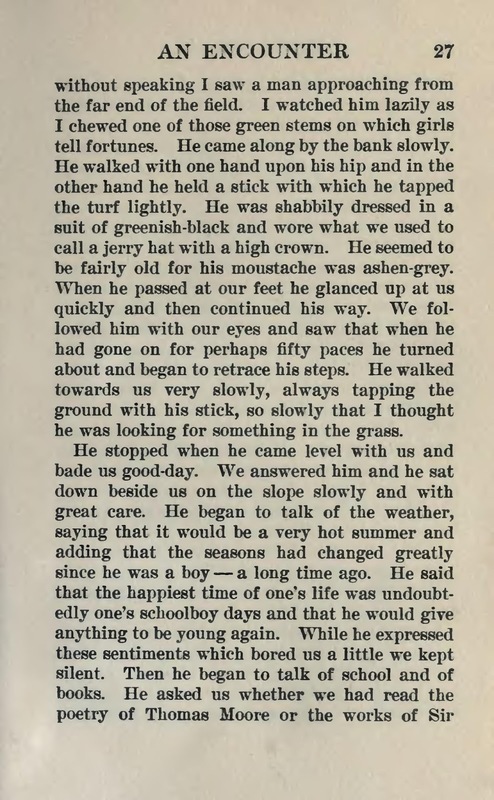 In this passive sentence, Beagle shows us the entirety of this character's life to this point. She's been waiting to see a unicorn her entire life. Now, she has, and this is the moment when Molly quits being passive and becomes an active character, reaching out to touch the unicorn before she forgives her and decides to leave her old life behind and throw everything into the unicorn's quest. For my money, this is one of the most beautiful and moving lines of dialogue in modern Fantasy. If Beagle had taken the hard line so many writing guides suggest and banished passive voice from his work, this sentence wouldn't exist, and our lives would be poorer for it. So while active voice is the better choice most of the time, it is by no means a hard set rule. TLDR: eliminating accidental passive voice will absolutely make your writing stronger, but choosing to use passive voice when appropriate is an artistic decision that can make it more beautiful. As with everything in writing, the choice is up to you. Writers truly are gods. There is no rule we can't break, no line we can't cross, provided we do it well. Quality is the only measure of fiction that matters, but the only way to ensure that quality consistently is to know what we're doing. 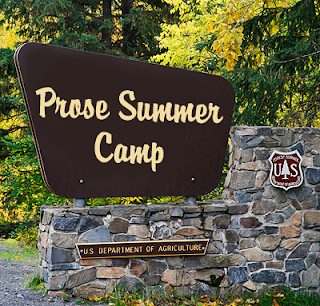 Learning to pay attention to our prose and understand how it works is the entire point of this Prose Summer Camp series. And while I can't being to think I've laid out a comprehensive study, I do sincerely hope I've helped shed some light on this arcane and fickle beast we call grammar. Thank you as always for reading! If you enjoyed the show, please follow me on Twitter/Facebook/Tumblr/Google+ to never miss a post. Keep cool, and I hope you're getting lots of writing done this summer! Thanks for another great Writing Wednesday! I'm more of a reader than a writer, but I love hearing your thoughts on the art of writing! I hate to be a Debi Downer with my first comment on your blog, but...I'm not sure that all your examples of passive-voice sentences are passive voice. Take this one for example: "It would be the last unicorn in the world to come to Molly Grue." The sentence's grammatical subject is the unicorn, but it's not being acted upon by anyone. "The last unicorn in the world was met with forgiveness by Molly Grue when it arrived" is passive because the unicorn is being acted upon while remaining the grammatical subject, and the sentence can be turned around so it's active voice where the same thing is happening, but now Molly is the grammatical subject: "Molly Grue met the last unicorn in the world with forgiveness when it arrived." Don't get me wrong; I love love love your books and your blog and your sarcasm, but as someone who is training to be a copy-editor, I find it hard to let this kind of thing go without saying something. Please forgive me. I think you might both be right. "The unicorn came to Molly" would have been straightforward, but the full sentence uses the same grammar but weights it (on the subject side!) so we feel what it means to Molly to be the object of that kind of attention. Or, "The alien was shot by Devi" might be exactly how the alien's home planet would put the incident to drum up revenge against Devi, if the victim's more important than the shooter. So the lesson might be, passive voice is less the idea of swapping subject and object, it's really a larger question of how putting your real focus into the sentences object slot opens up a number of indirect but handy tools. Sometimes. It would be remiss of me to comment on something I'm unsure about. But, here I go. Perhaps that sentence is passive in that nothing is actively happening. "Be" isn't an active sort of verb. We could change the sentence to be more active. "Unicorns never came to Molly Grue again" or something.